Forget the teenagers near the station holding handwritten "Hug me!" placards, and ignore the hordes of tourists and young girls checking out the teenybopper boutiques along Takeshita-dori. When you next find yourself in Tokyo's Harajuku, head instead for the Design Festa gallery, designfestagallery.com. Encased in a tangle of red piping, this former apartment block turned art gallery is the focal point of Tokyo's freestyle art scene. Inside, each room functions as an exhibition space, showcasing an ever changing lineup of up-and-coming Japanese and international artists, in fields from painting and photography to fashion and performing arts. With an approach that Design Festa's director, Takeshi Araki, describes as nonjudgmental and noncorporate (Design Festa doesn't take commissions on any sales), the only requisite is originality. Anyone can exhibit and anything goes. Anywhere too. 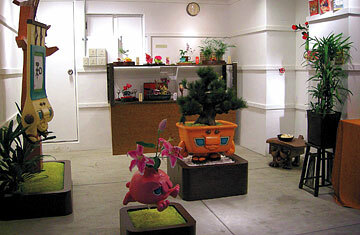 The onslaught of creativity extends to the walls of the gallery's mellow DF Café, df-cafe.com. Situated in a wooden building between the main gallery and an extension opened in 2007, the in-house restaurant Sakuratei attracts a laid-back collection of artistically minded diners, there as much for the bohemian vibe and vivid murals as for the savory okonomiyaki pancakes. Elsewhere across the gallery, even the mundane has been brought to life: trash cans have been turned into multicolored canvases and toilets bombed with paint and trinkets. The drink vending machine out front looks as if it has been visited by Banksy. And if all this inspires you to create something of your own, do. Araki and the rest of Design Festa's staff will be more than happy to help you leave your mark on the building. The only difficulty will be finding somewhere bare to do it.